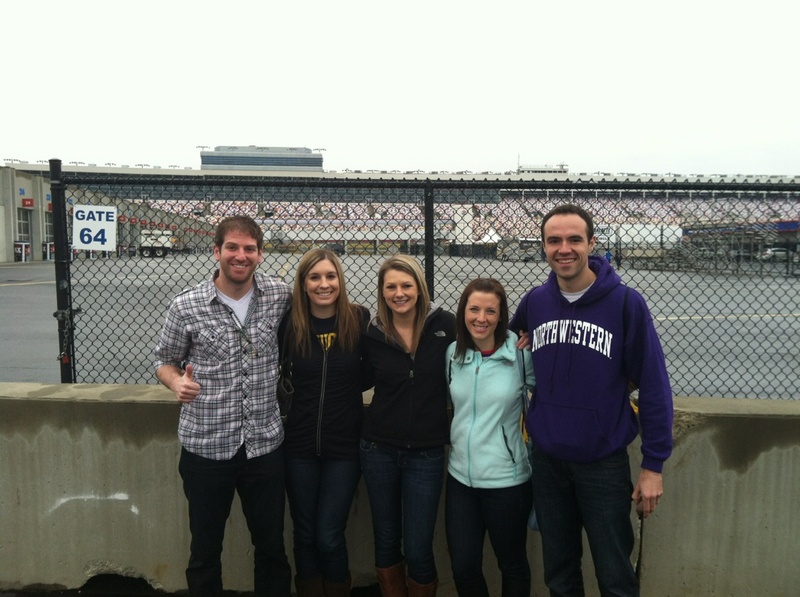 There were four of us sitting in the Toyota, staring up at the bright lights of the Charlotte Motor Speedway. We had parked with the rest of the early birds, in a grassy parking lot just outside the entrance. It was 6 in the morning, plenty of time before the NC Half Marathon would start. But we were huddled next to the vents, watching as rain shot by the enormous lights like a swarm of moths. I was in the passenger seat, keeping a close eye on nearby puddles to see if the splashes were getting larger and more frequent. In the backseat was Marla, who was aiming for a strong PR at her second ever 13.1, and Lindsey, future marathoner with the same plan. Driving the car was Ashley, who was going to toe the line for the first time. Otter and his friends Alexis and Chris hadn’t arrived yet. “This is totally my fault,” Ashley would say as we looked through the distorted windshield, rain sliding in silver streaks like mercury. 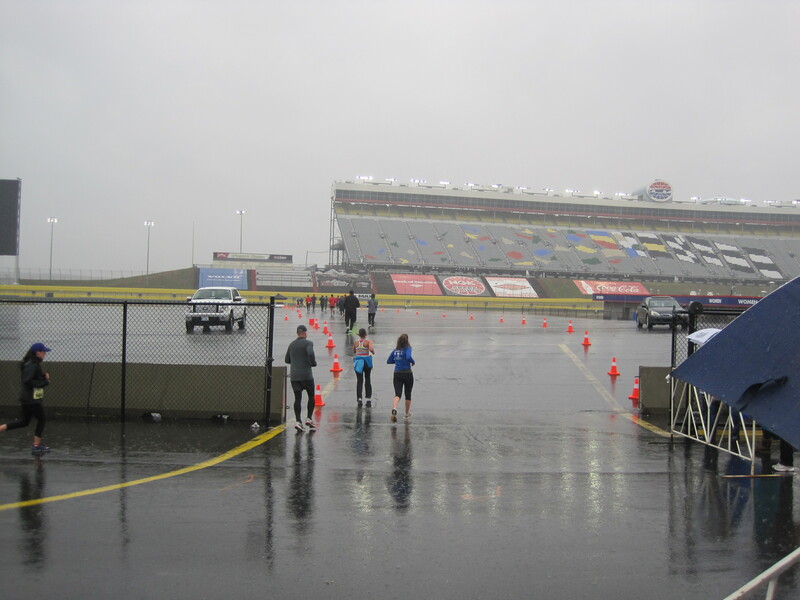 Though I had insisted with brimming confidence that I had never raced in rain and that I would bring them all my good fortune, the wet drive to the speedway from Ashley’s house hadn’t made believers out of my friends. For the time being, it looked like her bad luck with weather would overpower my pluvial control. 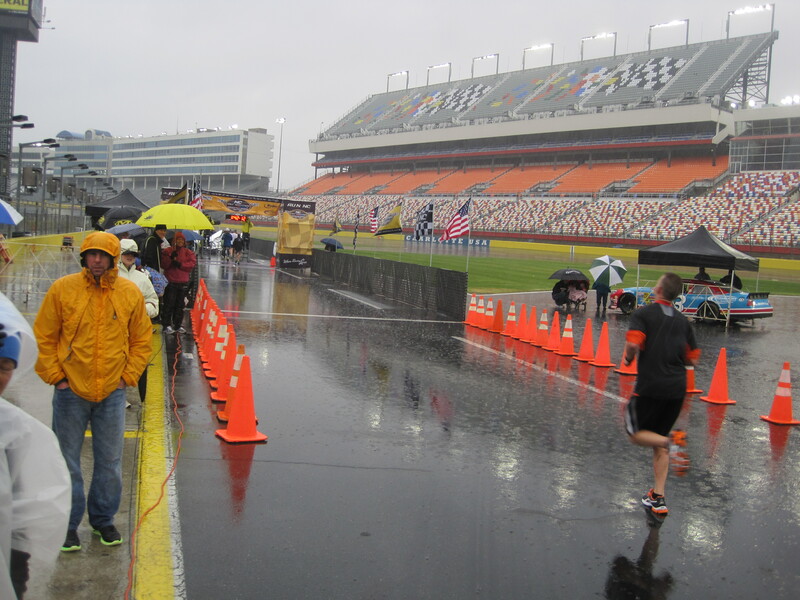 The Facebook group for this race had been full of weather-related comments all week, with several posts worrying about apparel and others simply pining for last year’s pristine conditions. In fact, I had originally planned on running this race last year. 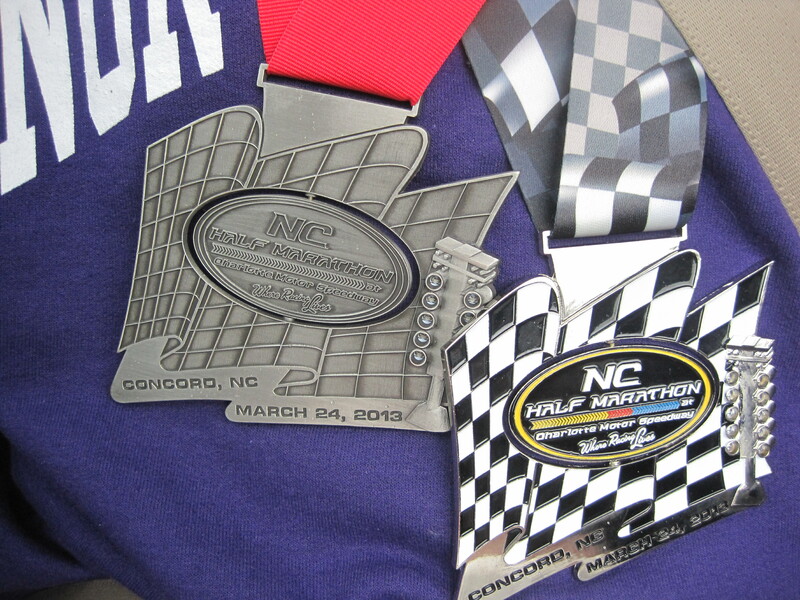 The organizers had sent an email blast for a shiny new half marathon in North Carolina with a shiny new medal. It was not only large and colorful, but had moving parts and LED lights. Honestly, I wouldn’t have been able to resist were it not for flights to Charlotte being oddly expensive. So I tabled the idea for this year. The deferral ended up working out because what would have normally been the typical solo excursion became a weekend of seven runners and many familiar faces. I ended up flying into Greenville and driving up to Charlotte Friday night. I arrived at Ashley’s house just after 11 PM assuming I’d have to sneak in to avoid waking everyone up. I was proven wrong as I entered the front door to find the entire family in the living room in the middle of a lively conversation. In just a few minutes I had added another entry to the long list of my friends with absolutely excellent families. We spent Saturday alternating between watching NCAA games and updating the weather forecast. Ashley and Otter would frequently drop their steely gaze from the TV screens at the bar to check their phones and blurt out the chance of rain, which never dropped below 70%. 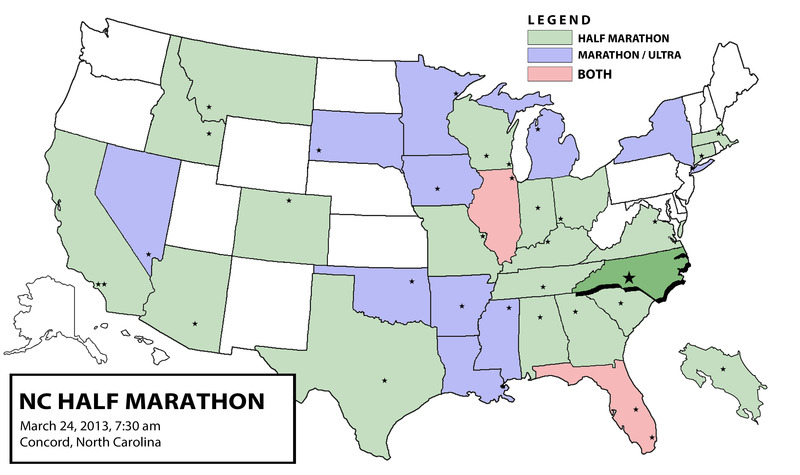 Though their respective alma maters won their games, the odds of running the next day’s race in dry conditions didn’t improve. I continued to insist that I was their wild card, their X factor, their ace in the hole – but I was flying in the face of an almost certain likelihood that my long-standing streak was coming to a harsh, sopping end. As we kept warm in the car Sunday morning, Mother Nature was making it quite clear that I had no godly powers. 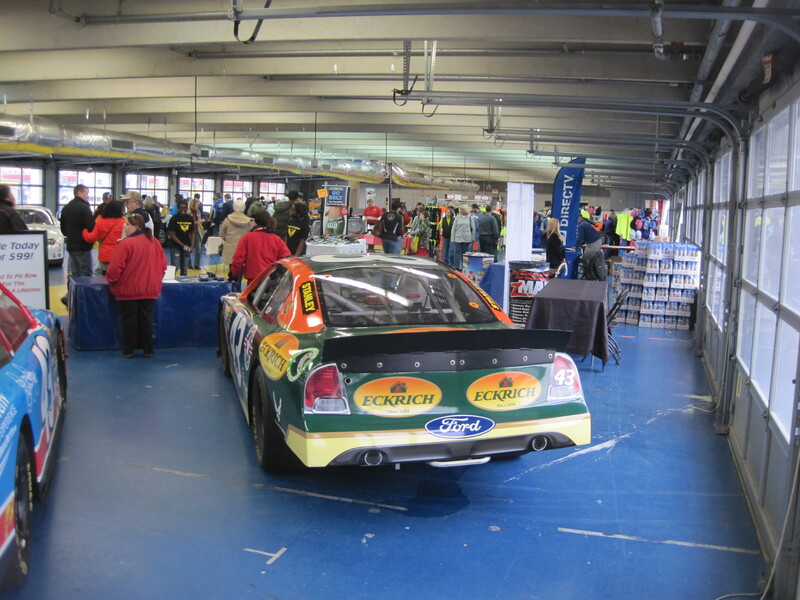 With thirty minutes to go, we left for the garage in the middle of the speedway, where packet pickup was held the day before. Hundreds of runners were packing the maintenance shack with twin lines of men and women spilling out of the bathrooms. We checked our bags and stayed inside until they made the official announcement for everyone to make their way to the track. 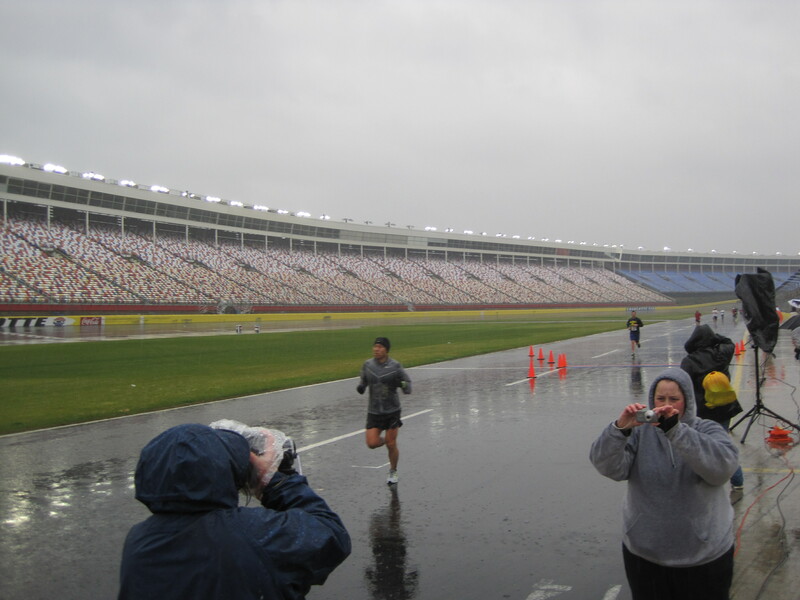 Followers of this blog will know that I’ve done several races that include an actual racecar track. But though these other events may flaunt them front and center, the racetracks are usually only 1-3 miles of the full race distance. 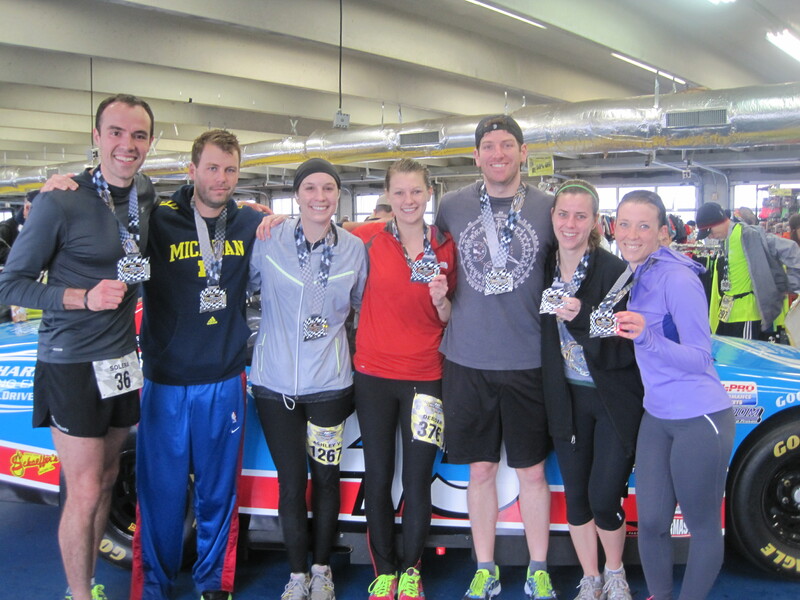 Even the nation’s largest half marathon only has you running on the Indianapolis Motor Speedway for about 2.5 miles. Not this race. 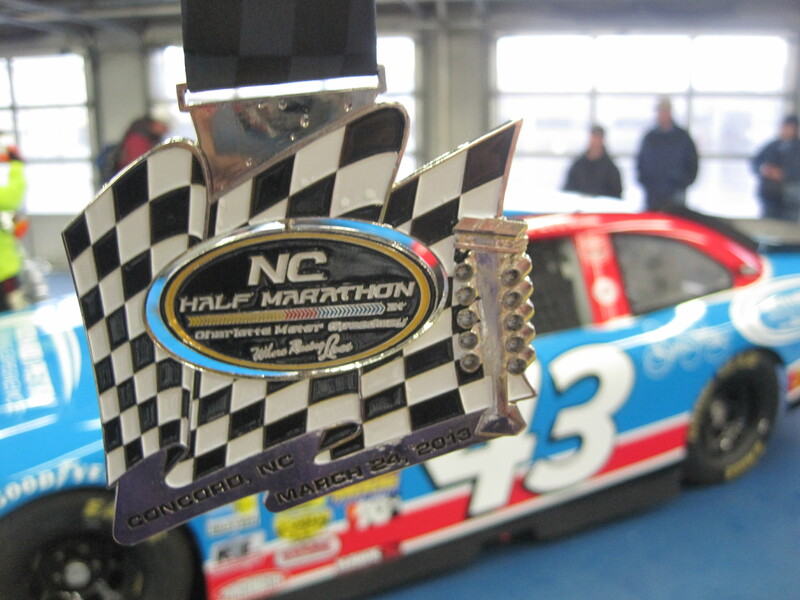 The NC Half Marathon not only starts and finishes inside the oval, it stays within the racing compound the entire time. Knowing this, I walked to the start and lined up with a hunger for speed. I hadn’t run a half marathon since August and didn’t have any others in my registration queue. In fact, this was the first time since February of 2009 that I wouldn’t have another half marathon in the near or distant future. My beloved distance had stopped being a challenge and was now a speed test. And a speed test this would be, not just for me. Marla had expressed that she’d be disappointed if she didn’t PR. I had told Otter that if he finished over 1:45, I’d be greatly disappointed in him. In turn, he said I would bring great shame to myself if I finished over 1:30. So this was not going to be your average fun run. I decided to wear my green Kentucky Derby miniMarathon t-shirt as a constant reminder of my purpose that morning. I was there to beat my 1:30:47 half marathon PR, set last April in Louisville, and if I ever looked down in fatigue, I would see that shirt and stay focused. There were no corrals, but signs with pace ranges. Given that I was out to PR, I stood in the area designated as “7:01 – 6:00.” I wasn’t joined by many others. I looked behind me and saw a crowd 1,200 people deep but I could count the people ahead of me with two hands. “Crazy Train” played on the speakers before the longest and cheesiest rendition of the national anthem I have ever heard. Finally, at 7:30 sharp, with the rain having completely stopped, we were ready to start. Organizers had brought an actual racecar to start ahead of the lead pack, whose tires squealed to life with the starting horn. It fishtailed and sped out ahead of the runners, leaving us to breathe in about sixty feet’s worth of exhaust and burnt rubber. It was a fun addition, but I could have done without the brief pulmonary discomfort. The full race course. Click for slightly higher definition. The race started with one big lap around the speedway. I held a 7-minute pace for this first mile, the handful of faster runners very quickly thinning out the field and disappearing into the asphalt horizon. After that first loop, we left the racetrack and went inside the oval, in pit crew territory and around the garage where minutes earlier we were keeping warm. It was here that I got a taste of just how many turns this race would have. But despite the constant tilting, I was cruising through the course, gaining ground on a few competitors. It’s amazing how simply having other people around you can make a fast pace feel easy. 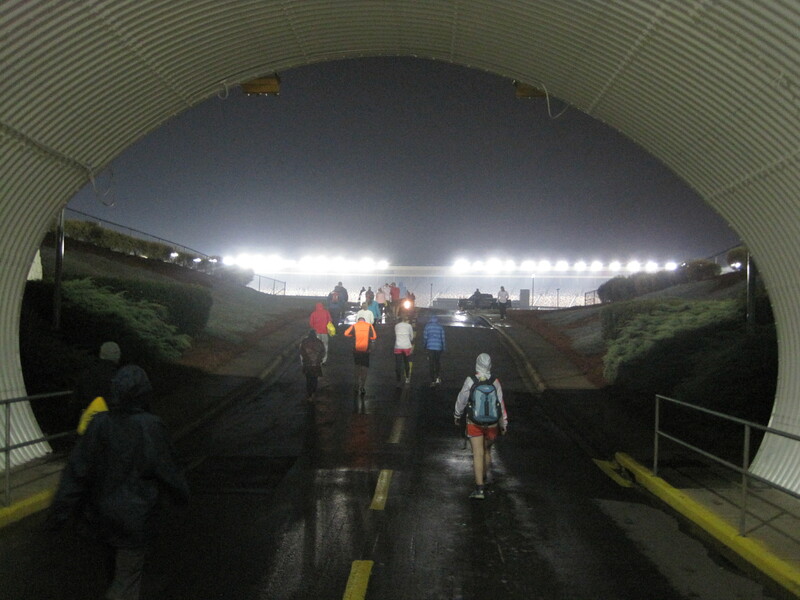 Just before the third mile, we left the speedway and head for the outside lots. This was where I was faced with an unexpected obstacle, yet one that had been in plain sight since the day before. While the speedway itself is definitely a paragon of flatness, the surrounding area was not. In fact, when we weren’t on a speedway, we were either going slightly up or slightly down. I had not counted on this when I made the effort of holding a 7-minute pace, or when I declared that I was going to try and PR, or when I told Otter he’d better run under 1:45 or face a public stoning. But it was too early in the race for self doubt, so I continued to hammer onwards. 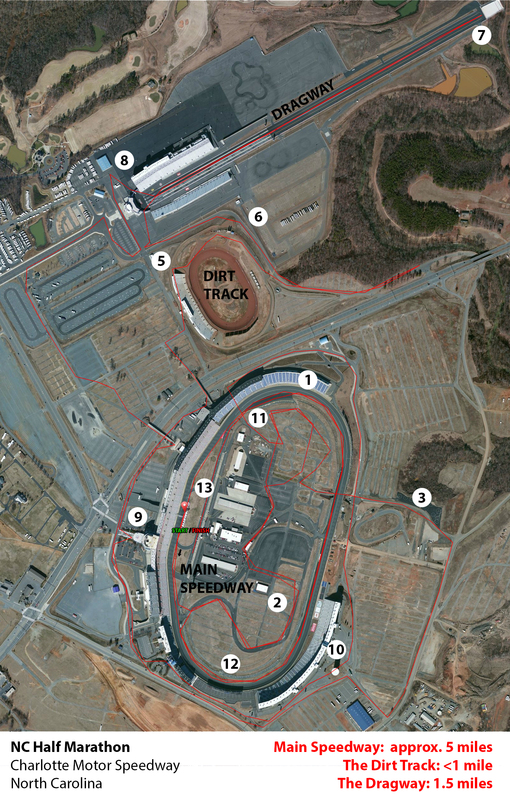 The next two miles would wrap around the speedway, reaching the highest point in the race: a pedestrian tunnel that arched over Concord Parkway’s six lanes of traffic. By any reasonable person’s standards, this wasn’t a tough climb. But I was racing a flat course ghost and couldn’t afford to slow down. A fast wind was rushing through the links at the top of the tunnel and I watched as my pace slowed on my watch. The downhill after this was a bit perilous. Not only was it a steep slope to descend, but the ground was very wet. I had collected a runner with a Universal Sole shirt along the way and he was right in my blind spot, drafting behind me. I didn’t think too much about it and kept my pace. Usually when this happens, we get separated at aid stations where I stop to walk. But somehow we had kept together, stride for stride. Around mile 5.5 we ran around the dirt track and faced a pretty nasty downhill. We passed an aid station that had three empty tables and one poor girl filling as many cups as she could while still offering them to passing runners. There weren’t many runners at my pace, so she was able to hold down the fort for the moment. We kept on at just under 7 minutes per mile leading into the Dragway. This was my favorite part of the course. Universal Sole was still in my blind spot, matching each stride as we entered the seemingly interminable road, a brisk wind pushing against us. It was so far it was difficult to see the turnaround, like those cartoon drawings of roads on the horizon. On our left, the pace car passed us with two fleet-footed runners leading the pack. I looked ahead and saw very few runners behind them, but always in groups. “You look like you’re out for an easy stroll,” Universal said to me in quick gasps. I laughed at that last comment, but it also got me thinking. Was I really competing for an age group award? While I had placed third for males 25 through 29 at the Oak Barrel half last year, that had come as a surprise. But this guy seemed to think that I was not only competing for it, but that I could actually do it. There didn’t seem to be that many runners ahead of me, but surely those that I had seen were my age. We finally reached the turnaround at mile 7, where we ran back to the entrance but with the wind at our backs. I could see wave after wave of runners approaching, each larger than the one before it. I eventually saw Otter, who was running with the 1:45 pace group. “Hey Dan, how’s it goin’ brother?” he enthusiastically asked across the concrete divider, clearly interrupting whatever mid-run conversation he was having with the pacer. I raised my fist in response. I couldn’t help but think that Otter being glib meant he wasn’t running fast enough. I would later learn that he assumed my non-verbal response meant that I was hurting. He was partially correct. While I finished mile 8 with a flat 7-minute mile, I was starting to worry that I wouldn’t be able to keep it up, painfully aware that we’d have a considerable uphill to conquer to make it back to the speedway. I dropped Universal Sole at end of dragway, leaving him to find a new pacer. Up ahead was a tall and surprisingly muscular runner who was wearing a white singlet with “USA” on the front. I caught up to him before turning left into a parking lot and up, up, up we went towards another pedestrian tunnel. Each time the road sloped higher, I felt myself leaning forward more. Eventually, I felt like I was running on my toes, the road so close I felt like I could scratch it. I wanted to slow down but I hadn’t built a buffer in the last 8 miles to let me “coast” to a new personal best. Once at the top, with the highway beneath us, I was beat, exhausted and in no shape to keep it up. After another steep downhill, we were back on the service roads surrounding the speedway, retracing our steps. I passed mile 9 in 7:14, my slowest split yet. At the top of a perfectly shaped hill, I looked down and saw that one of the safety pins on my bib loincloth had slipped out of the fabric of my shorts. I stopped to fix it, and in doing so, let the runner with the white USA singlet pass me. I picked it back up and kept him in my sights as we scaled hill after hill. It wouldn’t be long before reaching what I call the “half” wall. It’s like the symbolic wall that most marathoners hit around mile 22 except it doesn’t hit you in the legs, but in your lungs. I crossed mile 10 in 7:11, my arms swinging wildly and my breathing loud enough to hear inside the stadium. I groaned as I faced an ugly reality check: I would have to run 6:40 or faster for the rest of the race to finish under 1:30. I was struggling to hold just over 7 and no amount of effusive optimism was going to help. To add to my ever mounting list of hurdles, we were now entering the pit area of the speedway, whose multiple turns were acting like speed bumps. USA Singlet had passed a pair of young runners in bright, neon colors and I followed suit. I heard them curse as the three of us turned a corner into a fierce headwind. A few steps later we’d see that the 11th mile marker had toppled. It felt like an eternity but I was back on the oval, ready for another loop and then the finish line. I crossed mile 12 in 7:08 and reached USA Singlet right as it began to rain. We made the first turn, heading north, and faced the dreaded wind square in the chest. I cursed loud enough for him to hear, but I don’t remember if he responded. Harnessing what power I had left, I kicked the asphalt and ran in a straight line, through puddles and over slick paint, doing everything possible to avoid looking at my watch. My next competitor was so far ahead I could barely see him. With the stands empty, I felt like I was running completely alone. As I rounded the second turn, I saw the finish line ahead. My watch already read 1:30 but I couldn’t make out the seconds, as if I were in a dream. I turned my head and saw that USA Singlet was considerably far behind. Though I couldn’t quite sprint, I let the tailwind push me forward to a 6:20 pace for the final stretch. The announcer called me by name and I ran over the timing mats in 1:31:13, 26 seconds shy of my personal best. It was now raining significantly. I hobbled through the chute, taking only my medal before heading to the garage. As I entered, the volunteers clapped and cheered like they had at Disney, which made me feel like a pretty special guy. I smiled and threw two bashful thumbs up before getting a cookie. I changed into dry clothes as fast as I could and went back to the finish line with an umbrella. Despite the hustle, I missed Otter’s finishing sprint and ensuing PR. However, I did manage to accidentally catch a subpar shot of his friend Chris on his way to the finish line. The rain was coming down pretty hard and I was starting to get cold so I made my way back inside. I stopped on the way to take another course shot and saw Alexis. I bellowed some words of encouragement but her stare suggested she was in no mood for a pick-me-up. About an hour later, we were gathered by the gear check, exchanging stories and waiting for the rest of the gang to finish. Lindsey earned herself a PR with 1:54:17, Alexis fumed about her race experience with equal parts glee and hate, Chris lamented not catching up to Otter because of an unexpected bathroom trip. In the middle of one of these talks, I saw Marla erupt from the crowd with an urgent look on her face. I thought she was either going to tell us there was a fire outside or the British were coming. Instead, she threw down news of a stellar 13-minute personal best. So now it was just a matter of seeing whether Ashley had survived. Not only did she survive, but she beat her secret time goal of 2:30. While we waited for her to emerge from the crowd, Otter checked the age-group awards. As it turns out, something must have happened to all the truly fast half marathoners out there. The superhumans who can churn out 1:10s or 1:20s must have developed an allergy to rain because their absence allowed me to win second in my age group and thirteenth overall. In a field of 1,244 runners, I was flabbergasted. So we stuck around for the awards ceremony and yours truly left the race with a bonus medal and a big, goofy grin. After a round of showers, we took the party to Bad Daddy’s Burger Bar. It was a funloving bunch that included all the runners plus Ashley’s parents, her brother and our good friend (and my pledge son) Nick, who made the drive up from Greenville to see us. I had a few Kashmir IPAs and the “Mama Ricotta Burger” which included house-made mozzarella, pesto, vine-ripened tomatoes, pepperoncini and extra virgin olive oil. Though I didn’t run my fastest half marathon that day, I’m pretty sure I set a personal best by eating that burger in four bites. And so it was that on an excellent weekend spent with friends and family, I once again proved that I have cosmic powers, having kept the rains at bay until the very last mile, right when a nice refreshing douse was what I needed to finish strong. I don’t have any more half marathons on the calendar, which hasn’t happened since the day before I signed up for my very first one over four years ago. But I’ll be back to the distance once I’m done with these other insane undertakings. With my luck, those too will be free of pesky rain. I’ve managed to keep a pretty impressive streak going, so should you want to race in dry conditions, check out my calendar for the year and run with me. That is, if you can keep up. Those surprise hills and mini flood at the end of the race were nothing short of brutal which makes me even more proud of this group’s triumph. Congrats on another impressive race! Y’all are brave for running in that! I thought about signing up at the last minute, but the $85 entry fee kept me at bay. When I woke up on Sunday morning with lightning and thunder flashing outside my window, I felt like I had made a wise choice. I’m glad y’all had fun! Congrats on your age group award! We signed up back in July when it was just $50 (and I wasn’t yet a marathon junkie). Thanks for reading, Rex. I’ll let you know when it’s time for a SC marathon and you can tell me which local burger to kill afterward. It’s been a great start, so I can’t complain. Thanks for reading! I’m sure you have plenty of races to keep you busy and interested between now and Chicago, but best of luck with the journey past 13.1! 1:31:13! Nice work, Dan! You just continue to rack up the hits! This performance just goes to show that the elements can be secondary, if you make them that way. Way to fight through it and give it your best regardless. I tip my cap. I thank you for the kind words, Sir Jeff. I would gladly embrace your words of wisdom and say that I triumphed over the elements, but really, I just got enormously lucky (again) and managed to sneak by without having to face any of it. Do you remember the forecast for the Derby last year? Supposed to have been rainy as well. But I was racing, so it wasn’t. YOU’RE WELCOME. Great race re-cap. i’ve never run on a race track before, looks interesting. Great race! I highly recommend it, even if it’s only for a few miles of race course. You can’t help but feel fast when you’re touching the same surface as cars that blaze by at 160+ mph. Another entertaining and inspiring entry. Good luck next month in Kansas! Hey there. 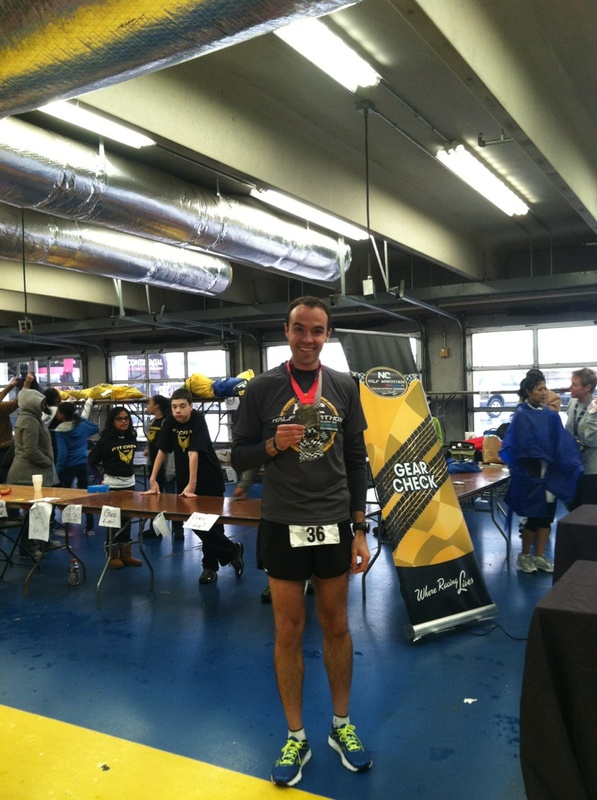 I did this race as well! Great race & venue especially if you like Nascar! For the 2nd annual, it was well organized! The rain and surprise hills were brutal. Well worth it though for the medal and the memories! Nice! Strong effort and inspired narrative… I felt like I was playing a track and field video game, banging away rapid-fire on the button to keep your legs churning while feeling the wind shift with every turn. Rain typically doesn’t bother me, but a stiff headwind always inspires a visceral reaction. PR or not, 13 out of 1,244 finishers and 2nd in your (highly competitive) age group equal an enviable day at the races. Then again, any two-medal day will send you home with serious street-running cred… plus the inalienable right to end your post with a challenge like that one. Lay it down, brother!